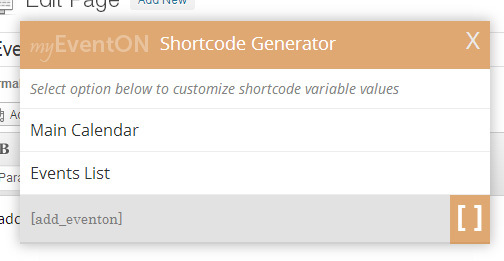 Shortcode Generator (SG) is an interactive generator for creating eventON shortcodes based on your needs that are available in eventON. How can I access SG? If you go to Pages> Add New or Pages click edit existing page next to Add Media button you should see Add EventON shortcode button that look like below. When you click on the ADD EVENTON button you should see a lightbox popup window shows up like below. 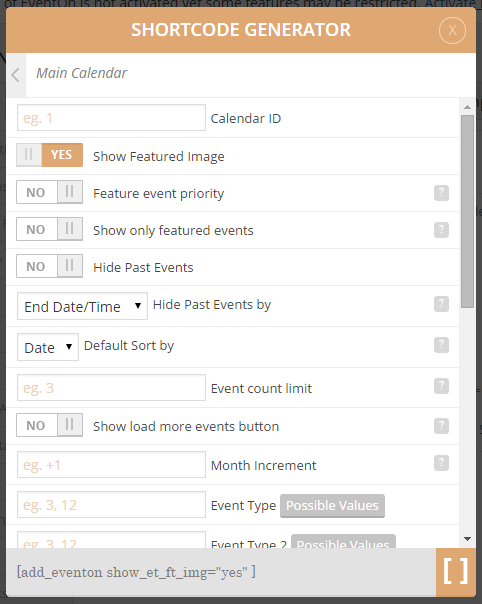 In here you can click on each calendar type (which is level 1) and then it will slide to left revealing more options you can select for that calendar type like the image below. In here with the interactive options panel you can select which options you like your calendar to use. Everytime you select different options the shortcode that is all the way in the bottom (footer) will change. You can hit the  button on bottom right or copy and paste the shortcode generated where ever you like. You can use the generated shortcode and use do_shortcode() function to run those inside php template functions. The above code placed inside the php template will run the exact same thing as using shortcode inside WYSIWYG editor.